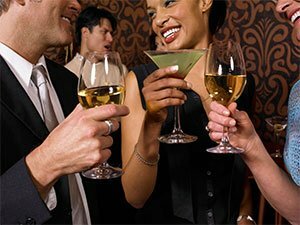 I’ve talked about the possible pitfalls of office holiday parties and how you can steer clear of some of the potential problems that can arise in my post Holiday Cheers Without Legal Fears. 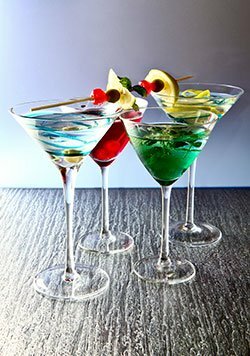 In addition to your annual office party, you’ll probably also be attending (or possibly hosting) some holiday cocktail parties. 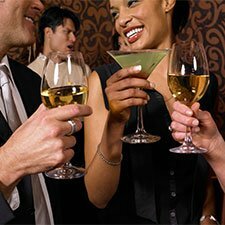 The speed dating aspect of cocktail parties isn’t restricted to the people. It also applies to the food. Hors d’oeuvres are a bit like speed dating as well – a brief moment in time and taste before you move on to the next one. 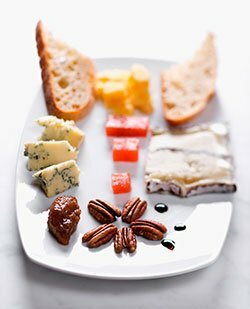 These types of menus usually follow a guide: of some hot, some cold, some meats and a crudité, cheeses and fruit trays, savory and sweet bites galore. Ironically, the trays of “sensible, healthy choices” always seem to get to you right after you’ve given up waiting for them and indulged in the more decadent “diet wrecker” trays. No matter what the flavor, the nibbles, along with needing a drink refresher, are a nice anchor when you need a break from the small talk (or need an extra moment or two to remember the name of the person who acts like they’ve known you forever, but you haven’t got a clue who they are). The cocktail-party question that inevitably arises every time is “So what do you do for a living?” And, you eagerly rattle off your elevator speech, thankful you can sound intelligent and coherent without much effort while you balance your drink and a small plate of colorful food that keeps threatening to make a break for the new and expensive looking rug under your feet. Because of a lawyer’s duties to rendering legal advice, I tend to start off with the disclaimer about not providing legal advice. Sometimes it’s uncomfortable, because the person thinks I’m trying to wrangle a fee, but I feel obligated to do so anyway. Like a hors d’oeuves, it’s hard for us lawyers to give a comprehensive legal answer when we only have a small bite of time and information. A lawyer’s automatic and natural response is to ask for more information, which can be inappropriate in a party setting, if you know what I mean. Like the assortment of appetizers passed on trays, the questions run the gamut from practical (what to do about speeding tickets) to absurd (how would I have defended OJ). Response: You have some choices to make when you are deciding on a legal structure for your business. There is no one “right choice.” Deciding on a legal entity is a lot like deciding what kind of car to buy. Everyone at this party may want a car but they all have different needs and preferences: Some of us want a sports car or a hybrid or a truck or a luxury vehicle. Similarly, some of us want a partnership or an LLC or a corporation. In Texas and many other states, you can create an LLC with the State of Texas. You can use my free Start Up checklist. Then, you can have your LLC make an “S corp” election on the federal level using IRS Form 2553. You can have both! Response: It depends. When a person dies without a will, Texas laws apply as to how the estate is divided. It is possible that community property (property acquired during marriage) is divided with one-half to you as the surviving spouse and the other half to your spouse’s children from a previous marriage. You and your spouse might consider visiting an estate planning lawyer to create wills—a will gives you the ability to decide how and to whom you’d like to leave your estate. I can refer you to a specialist and I have a free pamphlet from the Texas State Bar if you are interested in knowing more. Click here to request it.